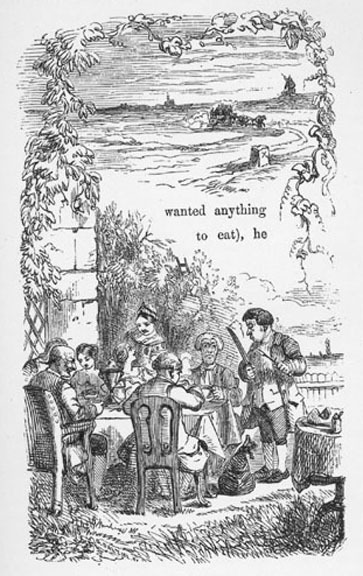 "The Breakfast," sixth full-page illustration by Sol Eytinge, Jr., for the Diamond Edition of Dickens's "Christmas Books"
Perhaps to change the subject, Dr. Jeddler made a hasty move towards the breakfast, and they all sat down at table. Grace presided; but so discreetly stationed herself, as to cut off her sister and Alfred from the rest of the company. Snitchey and Craggs sat at opposite corners, with the blue bag between them for safety; the Doctor took his usual position, opposite to Grace. Clemency hovered galvanically about the table, as waitress; and the melancholy Britain, at another and a smaller board, acted as Grand Carver of a round of beef and a ham. "Meat?" said Britain, approaching Mr. Snitchey, with the carving knife and fork in his hands, and throwing the question at him like a missile. Do you want any?" to Craggs. "Lean and well done," replied that gentleman. Having executed these orders, and moderately supplied the Doctor (he seemed to know that nobody else wanted anything to eat), he lingered as near the Firm as he decently could, watching with an austere eye their disposition of the viands, and but once relaxing the severe expression of his face. This was on the occasion of Mr. Craggs, whose teeth were not of the best, partially choking, when he cried out with great animation, "I thought he was gone!" 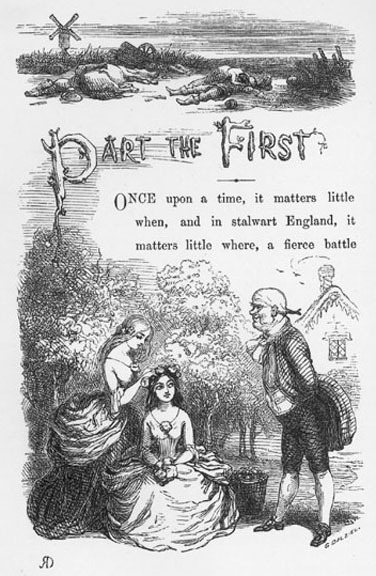 Left: Richard Doyle's "Part the First." Centre: John Leech's "The Parting Breakfast." Right: E. A. Abbey's "'Meat?' said Britain, approaching Mr. Snitchey, with the carving knife and fork in his hands, and throwing the question at him like a missile" (American Household Edition, 1876). Whereas in "The Parting Breakfast" in the original 1846 Bradbury and Evans edition, John Leech has been able to integrate two discrete scenes (the arrival of the stage-coach, upper right, and in the foreground the breakfast celebrating Alfred's birthday and his imminent departure for medical studies). Whereas Leech shows a number of figures seated around the table, Eytinge has been able to show only the faces of those gathered for the al fresco breakfast. His only fully realised figures are those of Benjamin Britain, carving ham (left), and Clemency Newcome, serving breakfast (centre). 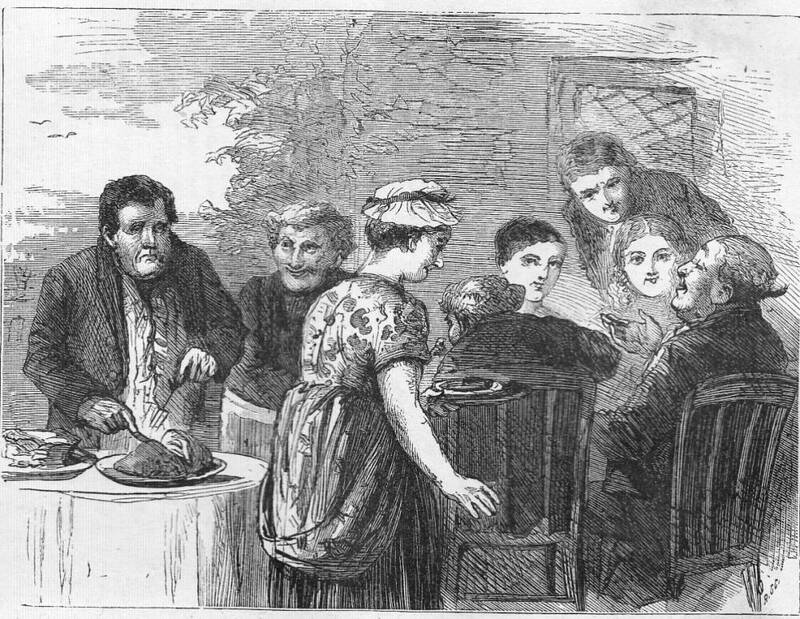 Clemency in her distinctive hat and print dress is obvious among a predominantly male company, which includes the lookalike lawyers Jonathan Snitchey and Thomas Craggs sitting across the table from one another, and Dr. Jeddler, holding forth at the far end of the table and gesturing to emphasize his philosophical notion that life is a farce. The only young man present, Alfred Heathfield, occupies a symbolic position across from his adoptive father and between the two Jeddler sisters. In contrast to Eytinge's sole illustrtation for the novella, Doyle's "Part the First" (1846, p. 3) prepares the reader for a plot involving the one sister's sacrificing her happiness for the other, but assiduously avoids showing either of story's young men. 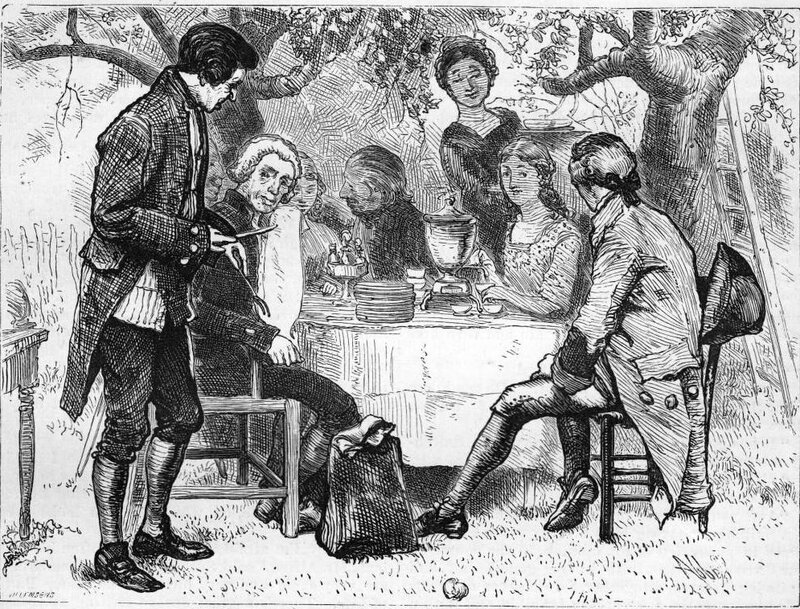 In his original versaion of the Eytinge illustration, John Leech utilizes the lively al fresco dining scene (also entitled "The Parting Breakfast") as exposition in that introduces among the extended family the country lawyers, Snitchey and Craggs, the whimsical fermale servant, Clemency Newcome, and the sardonic man servant, Benjamin Britain (right); moreover, in its simultaneous presentation of the arriving coach and farewell breakfast the wood-engraving by Leech is certainly more innovative pictorially than Eytinge's more static scene. Abbey's "'Meat?' said Britain, approaching Mr. Snitchey, with the carving knife and fork in his hands, and throwing the question at him like a missile" (American Household Edition, 1876) is more successful as an introduction of Clemency and Alfred, and is more pleasing as a composition through the variety of the figures' poses. There is no parallel scene in the British Household Edition volume of 1878. As to determining which of Eytinge's sisters is the younger and more attractive Marion and which the older, Grace, the reader must consult the text, without considering the visual distinction between the two established by the original illustrators. In Doyle's "Part the First," Grace (standing) adjusts the flowers in the hair of her sister (seated), so that Doyle's Grace is the blonde, Marion the brunette (although Dickens himself is silent on this point). The text establishes that Marion is "the wilful beauty" (138) — "the younger and more beautiful child," and that, during the breakfast scene, Grace, seated immediately opposite her father, cuts her sister and Alfred off from the rest of the diners. Accordingly, in "The Parting Breakfast," Eytinge probably intends the young woman right of centre to be Grace — even though she is clearly plainer of visage and dark-haired. As is characteristic of his illustrations of young women, Eytinge shows both Jeddler sisters with their hair up, even though the text mentions their "streaming hair" (137) when they are dancing in the orchard (evocatively realised in Doyle's "Frontispiece") shortly before the breakfast. By choosing this early scene, Eytinge has avoided touching on the subject that confounded Leech in the original narrative-pictorial sequence, namely, the plot involving Marion's disappearance and supposed elopement in "The Night of the Dance." Dickens, Charles. The Battle of Life: A Love Story. Il. John Leech, Richard Doyle, Daniel Maclise, and Clarkson Stanfield. London: Bradbury and Evans, 1846.